Special skill(s): Your equipment and Borg personnel may report aboard (for free, once each turn, if a personnel). Point-Box on card: 50 bonus points (your opponent can score points, when you use this card). Characteristics: affiliation, bonus points, Tractor Beam, Borg ship, Borg cube, ❖ ship. 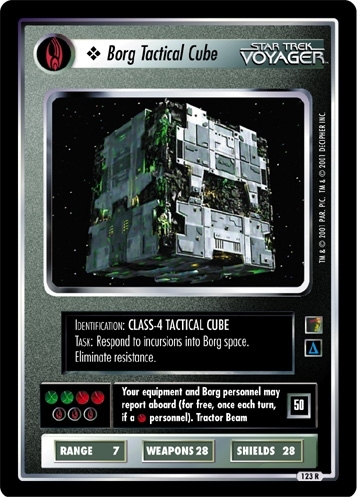 This ship is a “Borg cube” (for cards such as Commandeer Ship or Harness Particle 010) but may not be downloaded by Retask (which downloads the ship named ❖ Borg Cube). There are 38 entries for Borg Tactical Cube (ST1E 13 R 123) at the Tradeplace (92 haves and 11 wants). Click here to see all trade list entries for this Rare card!